Wondering how you’re going to tote your sprouts home from the Chicago Farmers Markets? Have no fear! Thanks to Jose Melgoza, winner of the 2013 COUNTRY Financial reusable bag design contest, market shoppers will be able to carry their locally-grown goods in style. Melgoza, a junior at Lane Tech College Prep High School, took first place and received a $1,000 scholarship from COUNTRY Financial. Melgoza beat 150 other students to win the scholarship. 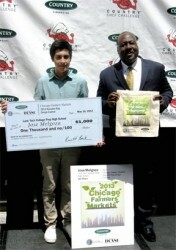 His award-winning bag features the words Chicago Farmers Markets sprouting out of soil in front of the Chicago skyline. “The phrase serves as the focal point to symbolize spring and growth in Chicago,” said Melgoza. Juana Delao, a Lane Tech sophomore, and Mara Hontanosas, a senior at Mather High School, were named runners-up. Each artist was awarded a $500 scholarship. Shoppers can pick up this year’s reusable canvas bags throughout the season at various markets to carry home their fresh goods. “This year’s theme sprouted great artistic creativity from our young designers. We were very impressed with the submissions and the talent of Chicago Public Schools students,” says Mike Fisher, COUNTRY vice president of market development. To see the winning design and other finalists, please visit www.CountryFarmersMarkets.com.